Bumblebees feed on the nectar and pollen made inside flowers. Nectar is a sugary liquid that gives bees energy. Pollen is full of protein which helps the body of bumblebees to grow. It is well-known that bumblebees are great pollinators, and therefore have a key role in producing much of the food that we eat. Bumblebees are disappearing all around the world because there are fewer flowering plants to provide nectar and pollen for them. Also, pesticides and other chemicals sprayed onto plants are killing bumblebees in large numbers. If bumblebee and other insect pollinator declines continue, people would have to find new and artificial ways to pollinate the crops that we grow. These artificial ways may not always be as safe or efficient as having bumblebees as natural pollinators. It could also make fruits and vegetables a lot more expensive for people. Bumblebees also help pollinate many wildflowers, allowing them to reproduce. Without this pollination, many of these plants would not produce seeds, resulting in declines in wildflowers. As these plants are often the basis of complex food chains, it is easy to imagine how other wildlife such as other insects, birds and mammals would all suffer if bees disappeared. We can all help save bumblebees by growing bee-friendly flowers in our gardens and not using any pesticides, insecticides or herbicides in our homes, gardens and schools. If you see a bumblebee that has lost its way and is trapped indoors, please switch off all the fans and any other devices that may inadvertently kill bumblebees and insects, and open the nearest window or door to let the bumblebee escape. You might have to gently catch the bumblebee using a box, jar or glass and a piece of paper and card, and then release the bumblebee outside. Sometimes you might find a tired-looking bee in your house or garden. It might be crawling or struggling, and you might think that it is about to die. However, a simple solution of sugar and water may help revive exhausted bees. 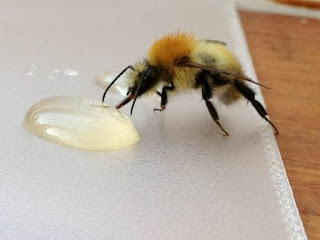 To create this energy drink to revive tired bees, the Royal Society for the Protection of Birds (RSPB) of the UK suggests mixing two tablespoons of white, granulated sugar with one tablespoon of water, and placing the mix on a plate or spoon. Do not add any more water, otherwise the bee could drown. Place the bee on the plate or spoon, where it will have a little drink, hopefully this can help it gather the energy it needs to fly back to its hive. You can also add the same quantity of water and sugar to a small container, such as an egg cup, and leave it amongst a patch of flowers in your garden or window box, so that bees can have a drink on the go before they get to the exhaustion stage. Don’t be tempted to offer tired bees honey – in most cases the honey isn’t suitable as a lot of honey is imported and may not always be right for native Malaysian bees. Some honey may also have sugar and other additives added into it. Only ever offer white granulated sugar – never offer demerara, brown sugar or any artificial or diet sweeteners. Leave the tired, thirsty bee to drink up and fly back to its hive. If you keep nudging or pushing the bee, you might stress the bee further or end up getting stung. If your exhausted bee fails to pull through, please don't feel too sad or guilty. You tried your best. Plus, the bee may already have been injured or is beyond saving. The important thing is that we all now know that there is a little something we can do to help bee populations and individual bees.